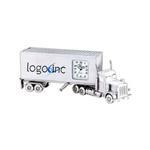 Custom Semi-Truck Stress Reliever with your personalized logo. 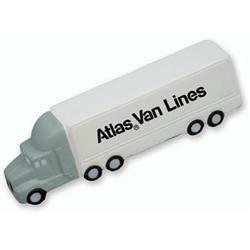 These Semi-Truck Stress Relievers fit in well with the transportation industry and moving or relocation industry. 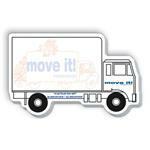 Collect a truckload for your next convention and promotional event. They are handmade, squeezable and logoed stress relievers. Inquire for rush. Available Colors: White with grey and black trim as shown. Dimensions: 6" W x 1 5?8" H x 1 1?4" D.
Typical Imprint Area(s): Side: 3 1?2" W x 3?4" H Top: 3 1?2" W x 3?4" H Back: 7?8" W x 7?8" H *Imprint is available on side, top or back. Please specify. Available Imprint Options: Price includes a one-color, one-position imprint. Imprint area may vary depending on art submitted. Unless otherwise specified, your imprint will be positioned per the item photograph. Additional Colors/Positions: Add $.25 each. Bulk/250 pcs = 24 lbs.